Residential Dining welcomed the Year of the Pig with traditional Chinese performances and cuisine. 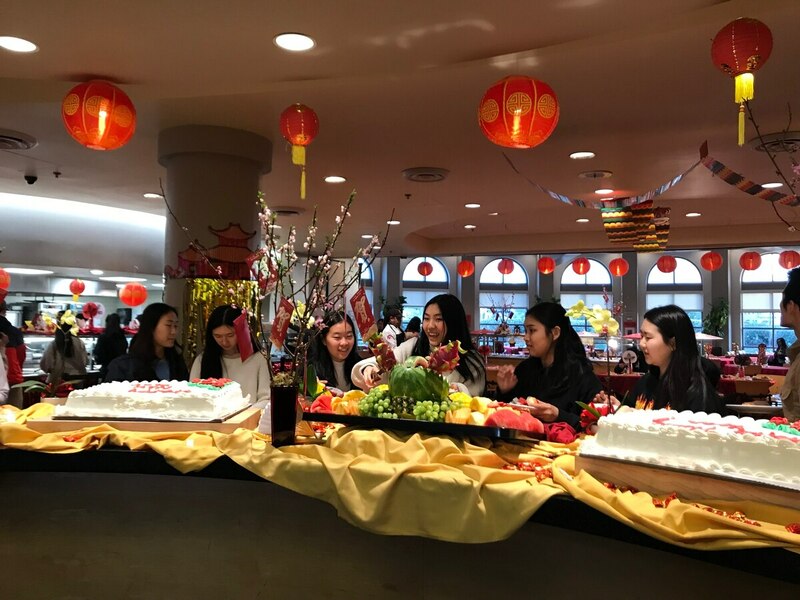 Students select from a variety of traditional Chinese fruits and desserts at Parkside Restaurant and Grill during the Lunar New Year celebration. For international and out-of-state students, celebrating the Lunar New Year at home with family is a near impossible trip to make. USC Residential Dining, however, brought the sights, smells and sounds of the familiar celebration to Parkside Restaurant and Grill Tuesday night. Ornate red and gold decorations filled the Parkside Residential College dining hall in celebration of the Year of the Pig. The event, which was part of the themed dining hall programming, invited students to dine on traditional Chinese dishes amid a backdrop of Chinese drumming. We "recognize that the [international population] is such a large demographic within the University population [and] that this was one of the themes we thought we could bring to one of the larger populations," said Erik Russell, associate director of Residential Dining. Residential Dining partnered with members from Asian Pacific American Student Services in an attempt to research and design an authentic theme night, which borrowed cultural motifs from the Chinese Lunar New Year celebration. "Dining services requested a meeting and we reviewed their plans for the night," said Jonathan Wang, director of APASS, in an email to Annenberg Media. "They were cognizant of how the event could honor the customs while inviting others in on the celebrations." Russell said that by collaborating with the organization, he hopes that all students, particularly Chinese and Chinese American students, felt at home during the event. International students make up nearly 24 percent of the student population at USC and the 5,628 students from China constitute 50 percent of the total international student population. "We always want to make all of our guests feel at home whether it is a theme night or not," Russell said. "We try to do the best we can and I think that becomes a challenge and expectation. We're just trying to do this for a few hours and highlight and showcase the Chinese culture and … make them feel at home as much as possible." Yunjie Liang, a freshman double majoring in communication and economics, said while she was not able to fly home to Anhui, China, she appreciated the opportunity to celebrate the new year at Parkside. "[This event] makes me feel like I am at home … and I think it shows the school really respects our Chinese people and respects our festivals," Ling said. "I felt that a lot of the red packets and the decorations [were] very Chinese, and also I think it [was] a good chance to publicize the Chinese culture to … all the students at USC." Florence Yang, a freshman majoring in computer science, said celebrating the Lunar New Year at the event with her friends made her forget about having to miss her family's traditional Taiwanese-inspired dinner. "I was originally pretty sad that I could not go home because when I called my parents they were telling me about all the good food they had." Yang said. "But, going to Parkside was a nice way for me to feel better about being here." Cultural performers performed longwu, which is a traditional dragon dance often seen during the Lunar New Year in Chinese culture. The dragon in Chinese culture symbolizes good luck and prosperity. "There was some outreach to [APASS] and … they had someone come in and there was someone to speak to that [was] familiar with the Lunar New Year, what to do, what not to do, and how to be culturally sensitive," Russell said. 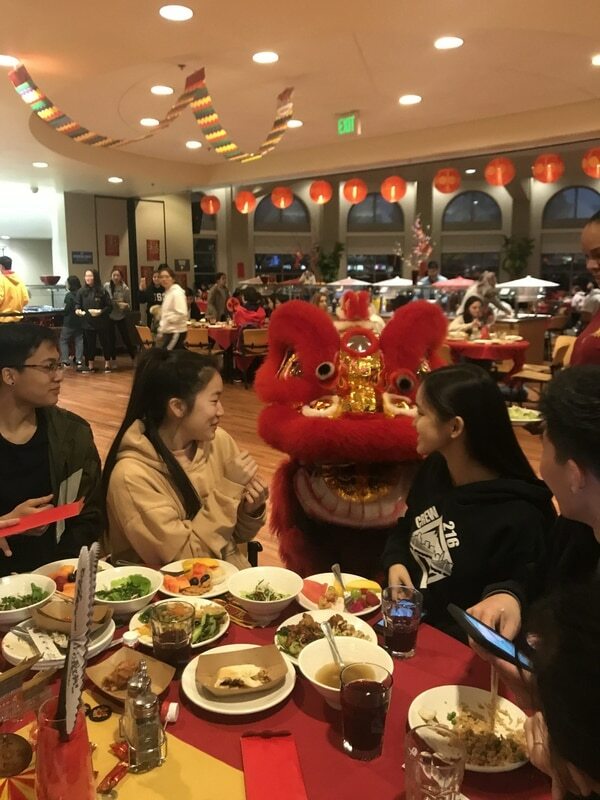 Many students in the dining hall filmed and interacted with the performers during the event, handing the performers, who wore elaborate dragon costumes, fortune cookies and food from their tables, only for the "dragon" to eat the food. USC Residential Dining staff also handed students red envelopes enclosed with chocolate coins to mirror the Chinese New Year tradition of giving family and friends red packets full of money for good luck and happiness. Russell said in an effort to create a genuine experience for students, the chefs researched closely on the Lunar New Year dining menu. "Our chefs, in terms of the menu design, are trying to incorporate some of the aspects of Lunar New Year in terms of abundance, good luck and what that means for that population," Russell said. "We reached out to people when it comes to the cultural themes to make sure we are crossing our 't's and dotting our 'i's." The themed menu included classic Chinese dishes such as sung choi bao, or Chinese lettuce wraps, and lo han jai, or chinese vegetarian stew, and came with suan mei tang, a traditional sour plum drink. York Song, a graduate student studying public administration, said while he was able to return home to Shanghai in January, the dining event was a nice gesture for students who were not able to see their family and fully celebrate the holiday. "I feel like [I am] home because there [was] someone pretending to be the lion … and the drums, so it feels like a traditional Chinese New Year," Song said. "It is definitely helpful to [all] international students, not only Chinese students. I really appreciated it." Ruiyi Shen, a freshman majoring in electrical engineering, said while the traditional Cantonese dishes and gold decorations seemed to focus solely on the Chinese celebration of the Lunar New Year, the occasion is celebrated throughout most of Asia. "This is a really good opportunity for the Chinese population [at USC] to gather around and celebrate this festival," Shen said. "Not only Chinese, but all Eastern Asians. It does not only have to be a Chinese thing because it's a global culture."